So one day while on jury duty we were given an extended lunch break – roughly two hours – so there was plenty of time to go exploring. My sojourn took me up through Little Italy, past the excellent-looking Alleva Dairy (where I seriously considered eating) and further north into the Village. I weighed eating an entire pie at Lombardi’s by myself but thought better of it and continued strolling as it was a nice, sunny day, and relatively spring-y out. I’m glad I did, because I stumbled upon Parisi Bakery. 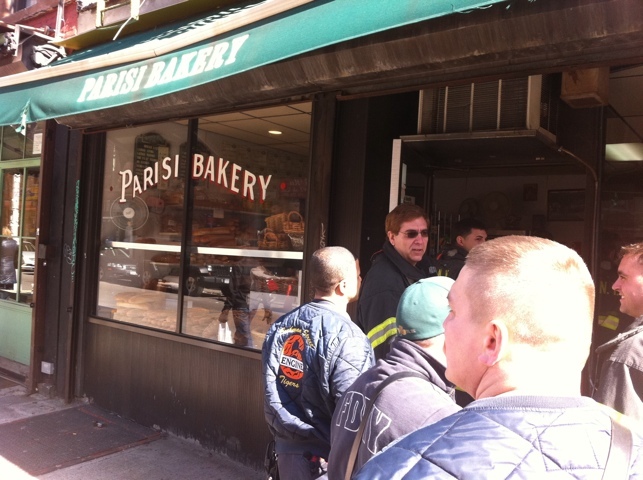 More directly, I stumbled upon the line of firefighters queued up out the door of Parisi. 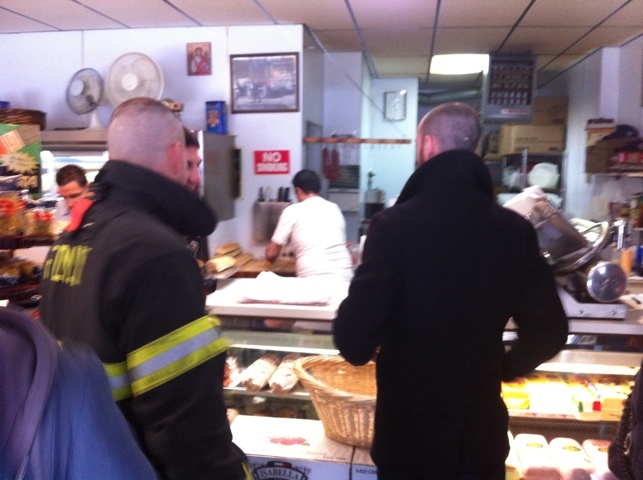 For the uninitiated, it is well known that New York City firefighters and police personnel often know of the best local places to eat. I immediately got in line with them. Not a large shop, but big on portions, and heart. Parisi is a real throwback to a part of New York that I regret to say is largely dead in Manhattan. The rest of the boroughs you can still find this sort of thing, but as Manhattan has become more expensive and gentrified hole-in-the-wall joints like this have largely been crowded out by places that sell you overpriced underwear. It is a family-run joint, and while I can’t swear to this it sure seemed that the tattooed gentlemen behind the counter was married to another woman who was also serving up sandwiches. They had that type of rapport. This is not the sandwich I ordered, but I gawped when I saw that monster. It looked like Pac-Man eating gourmet food. 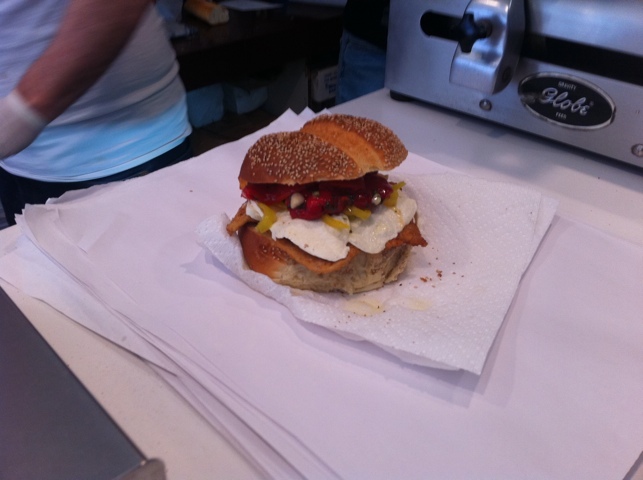 As you can see the sandwiches looked gargantuan and filled with fresh products. There was something about the place that seemed filled with old-world charm and real care for good ingredients and value. That makes perfect sense: it turns out the place has been around for more than 100 years! But even before I found that out I was transported to a different era. There was something about the clowning between the folks behind the counter, the firemen, and some of the apparently regular customers. The place had a great vibe and I was getting excited. The Italian combo from Parisi. This is the whale of a sandwich that I ordered and as you can see it looked terrific. I got an Italian combo with roasted red peppers and fresh mozzerella. 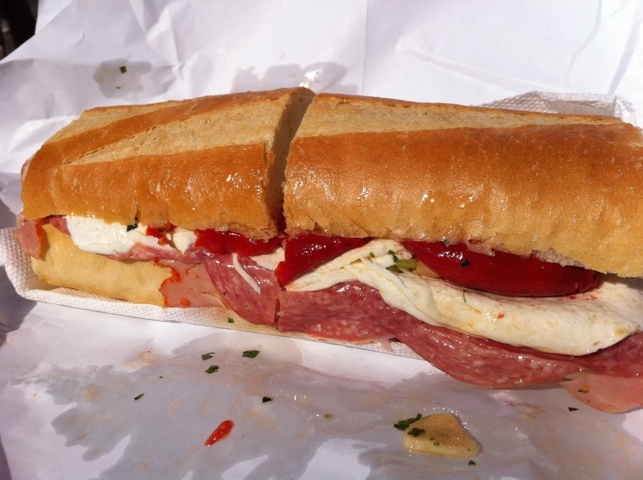 The most important thing in the above photograph, though, is the sliver of garlic sitting in front of the sandwich. The dressing they pour onto it has fresh garlic in it! For a garlic-lover like me, this is a HUGE win. Of course, fresh garlic alone does not a great sandwich make… . Just look at it... . The sandwich consisted of a few different types of pork products (hams and salamis) sliced so thin that at times they seemed transparent. They melt on the tongue when you bite into them. 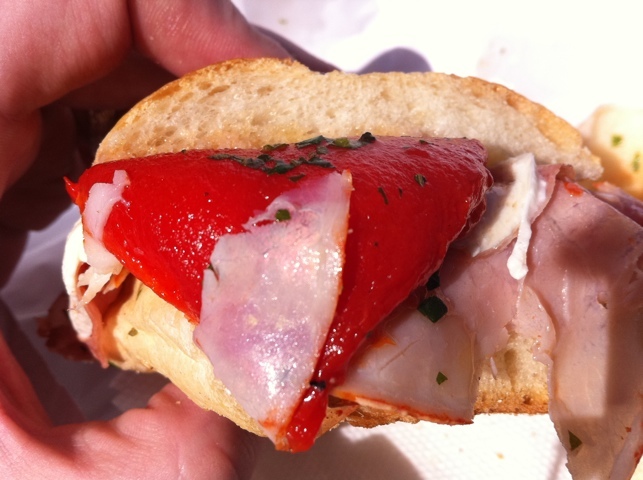 Those roasted red peppers and fresh mozz were both marvelous. The bread was just right: not too heavy, not too light, just enough fight. The dressing was garlicky (perhaps basil too?) and delightful. I think you get where I’m going here: the sandwich was terrific! All in all, I’d say it was better than Faicco’s, and well worth the $10 it cost me. Frankly as a die-hard NYC foodie I am a bit embarrassed to admit this place had eluded me for so long. My favorite kind of sandwich! I love when fresh mozz is used. Be warned – it’s a pretty good hoof. You’ll need a longish break. But it’s well worth it!